Arsenal fans have been lucky to see their playmaker, Mesut Özil, having a decent run of form of late. Hopefully, that won’t change now that the creative midfielder has taken to streaming, showing off his new Twitch setup on Twitter. Özil’s inaugural stream saw him playing a lot of Fortnite, and not looking too shabby either – his squad put in some decent rounds, but didn’t quite manage a Victory Royale from what we saw. Alongside his streaming venture, Özil is also looking to break into esports. In August he announced that he’s working with eSportsReputation, an agency, to create Team Özil (via SportTechie). Naturally, Team Özil will play FIFA, and are currently scouting for talent. Özil is far from the only football player making waves in the esports world or in streaming. We’ve already seen Barcelona’s Gerard Pique working with Konami to set up a new esports league, while former Chelsea and Newcastle manager, Ruud Gullit runs a Fifa esports Academy, and a trio of Spurs players in Harry Kane, Dele Alli, and Kieron Trippier have joined Leicester City’s Harry Maguire for a game of Fortnite occasionally as well. 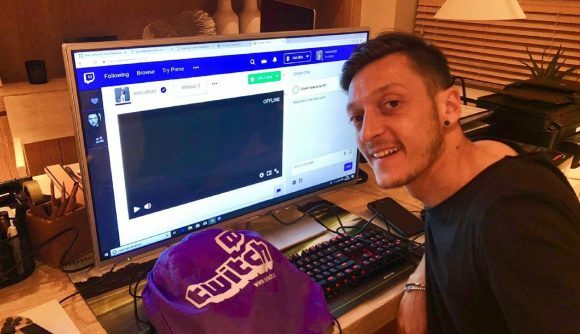 Mesut’s new streaming channel – which you can join here – comes after he retired from the German international team, a decision that caused a bit of a ruckus earlier this year. That doesn’t seem to have affected his form in the long run, though, as Özil has been looking pretty lively in an Arsenal shirt lately. Let’s hope all the late nights playing Fortnite and making airhorn noises for his viewers don’t affect his performances on the pitch.